TOMORROW’S total lunar eclipse will bathe the Moon in a red glow, as seen from the Earth – but what will the eclipse look like from the Moon? the alignment of the Sun, the Earth and the moon will shroud the moon in darkness for one hour and 43 minutes. From the surface of the Earth the full Moon will slowly creep into the Earth’s darkest shadow, known as it’s umbra. The lunar eclipse will look like a dark disc slowly moving across the moon’s face before the orb starts to glow red from refracted sunlight. But if you were to observe the lunar eclipse from the moon, you would be treated to a very different and much more spectacular sight. On the moon, your gaze would fall straight onto the Earth obscuring all sunlight from the burning star directly behind it. The Earth would in turn appear to glow around its edges with an intense corona of red sunlight, much like the moon does during a solar eclipse. The corona of light would be every single sunset and sunrise happening at once on the planet. 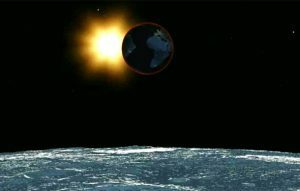 NASA said: “When viewed from the moon, as in this animation, the Earth hides the Sun. “A red ring, the sum of all Earth’s sunrises and sunsets, lines the Earth’s limb and casts a ruddy light on the lunar landscape. As breathtaking as the image may be, the view from Earth should plenty spectacular to enjoy as it is. Beams of refracted sunlight scattered through the planet’s dusty atmosphere will paint the Blood Moon a red-to-orange hue during totality. The effect known as Rayleigh Scattering is also responsible for the intense red colour of sunsets and the deep blue of the skies. If you live in Central Asia and Eastern Africa, you will be best positioned to watch the Blood Moon. Other outlying areas such as the UK or Australia will see the reddened moon around moonrise or moonset respectively. In the UK, the moon will peak over the horizon in the south of the country around 8.50pm BST and the eclipse will be visible everywhere.